This "Full Cup" definitely runneth over! 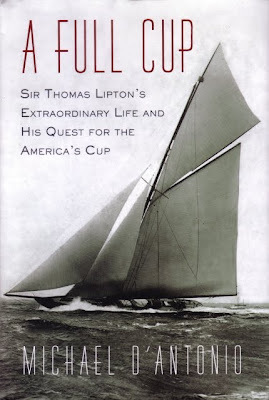 Thanks to my friend Frivolitea I learned about "A Full Cup" by Michael D'Antonio, a new book about Sir Thomas Lipton's life and his quest for the America's Cup. Frankly, the sailing stuff doesn't much interest me, and I expected I would probably read only half the book at best, but I happily devoured this marvelous story and hope some of you will read it as well. I knew Lipton was a tea merchant, and I'd read he was a whiz at marketing, but that was about it. After reading this book, I now know he was perhaps the world's greatest example of a self-made man, a brilliant businessman, a generous-hearted soul who was kind to the poor, and in the world of sport, an incredibly gracious loser. Young "Tommy" Lipton was raised in the slums of Glasgow, and at 18 he set off for America to seek his fortune. Arriving in New York Harbor in 1866, Lipton was one of many immigrants needing a job and ultimately ended up heading south to work as a farm laborer in Virginia, then on a rice plantation in South Carolina, then with a streetcar company in New Orleans. He decided to give New York one more try, and this time he found a job at A.T. Stewart's department store, a job at which Lipton not only excelled but also learned the skills that would set the course for the rest of his life. After saving some money, he took his new retail skills and headed home to Glasgow, where his parents ran a tiny grocery. In a sign of things to come, he bought gifts for his mother that he knew would impress the folks back home, a rocking chair and a barrel of flour, and had them placed on the roof of his horse-drawn cab as he approached home. The crowd that followed did not fail to notice that little Tommy Lipton had grown up, and now "Thomas J. Lipton" was back and ready to rumble. When he couldn't — at first — talk his too-humble parents into expanding their business, he figured out how to work the grocery trade on his own. 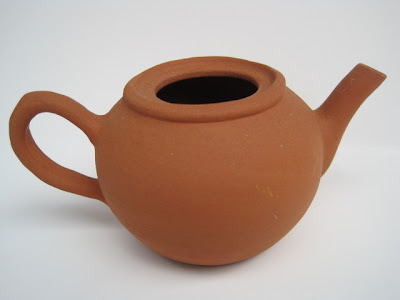 Soon his father relented and gave his blessing for Lipton to open another store. Lipton had learned the value of buying in large quantities in order to offer lower prices, and in 1871 he opened Lipton's Market. Lipton's marketing genius was shrewd enough that D'Antonio titled one chapter of his book "P.T. Lipton," and it appears to be an apt name. Horse-drawn vans traveled through town with the Lipton name painted on the sides in large letters. A new store opened. Lipton was selling so much pork he opened his own slaughterhouse to solve the supply problem. Brilliant at the art of getting free publicity, Lipton would send hams to the rich and powerful and then publicize their thank-you letters, such as one he received from the mother of Eugénie, last empress of France. 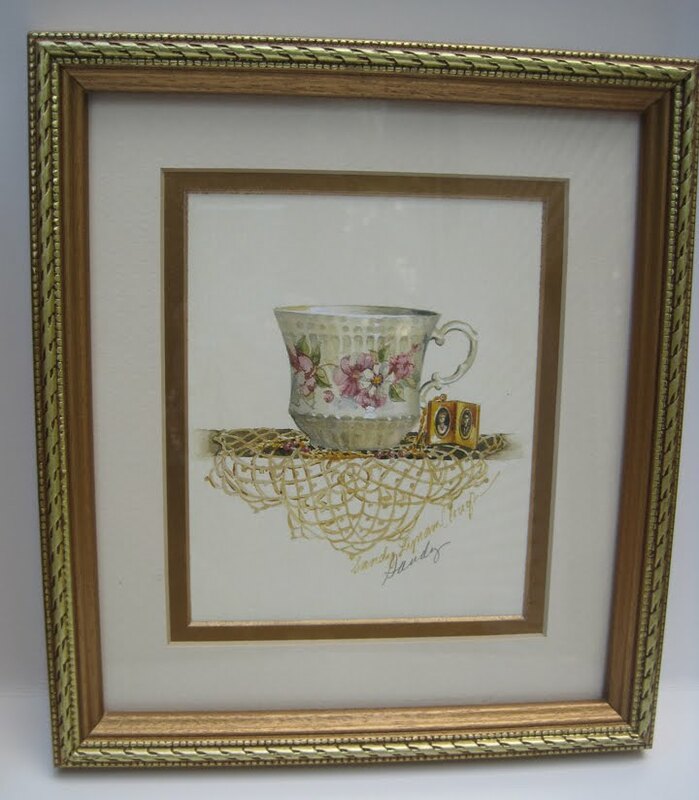 By 1880, Lipton had 20 shops in Glasgow and was ready to move into England. The best chapter in the book for tea lovers is no doubt "Tea Tom," in which D'Antonio tells how Lipton, originally ambivalent about the tea trade (imagine! ), began to gather information about the tea business and realized the profits that could be made. 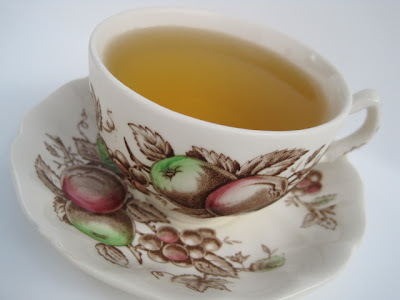 I greatly enjoyed learning about Lipton's research into creating a quality brew: "In Lipton's tea, drinkers got a high proportion of orange pekoe — OP for short — that had been handled with the kind of care a good winemaker applies to fine grapes. In the days before machinery took over much of the work, pickers plucked the leaves with the pads of their fingers, avoiding the creases and cuts that their nails might make." 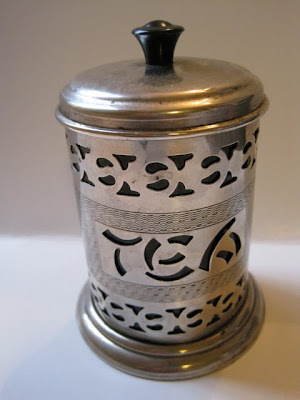 Soon tea money was coming into his stores (which now numbered 300), and in 1890 Lipton sailed for Ceylon to shop for tea estates, which resulted, as we know today, in great success. Lipton was apparently quite the celebrity back in the day, and I constantly marveled at the famous names in his circle of friends and acquaintances: President Rutherford B. Hayes, Prince Edward (whose mother, Queen Victoria, had knighted Lipton), Princess Alexandra, William K. Vanderbilt, J.P. Morgan, President Theodore Roosevelt, Louis B. Mayer. At times, it seemed that Lipton was like Forrest Gump and simply turned up everywhere! Of course I haven't even touched on the quest for the America's Cup, which any of you interested in sailing will no doubt be thrilled to read about. Even in that portion of the book, this admitted landlubber found treasures like this: "Three-o'clock tea on Lipton's yacht, which sometimes involved a hundred invitees, was a lavish event, worthy of Miss Cranston. Each guest's cup was delivered on an individual silver tray that also carried a slice of lemon, two lumps of sugar and a dragon's-head milk pitcher. Broiled fowl and pastries would be accompanied by champagne, and each guest received a small present at the end of the meal." "A Full Cup" was much, much more fascinating reading than I had dared hope, and I am delighted to recommend it to my fellow tea lovers! ... actually this one is a small tablecloth, not a tea towel, and all four corners have a different piece of teaware embroidered on them. Now there is a reason these pieces were on clearance. 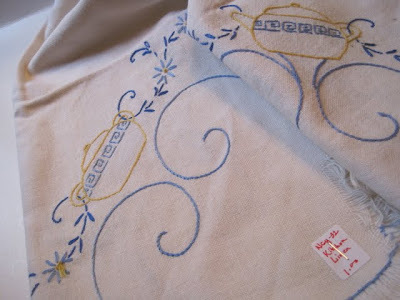 All had stains or a small tear, but the designs were all intact and, I thought, well worth $1 each. 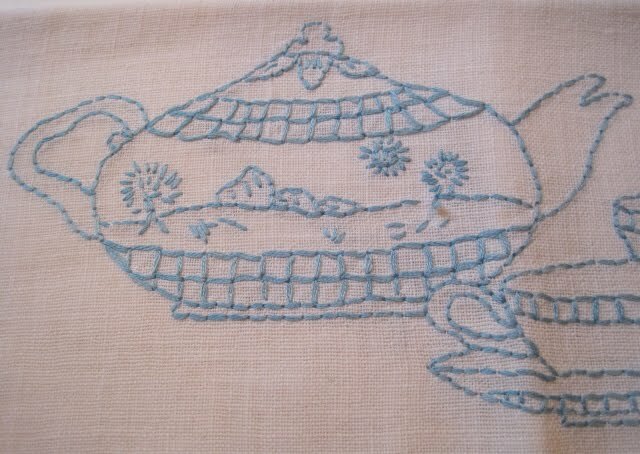 I also found a vintage tea caddy, which was a little more than $1, but I am most proud of my newly-rescued linens! My husband surprises me sometimes, both literally and figuratively. On Friday he traveled several hours away to Alabama for the funeral for his 97-year-old aunt. (Her name was Grace, and he said everyone chuckled when the song "Amazing Grace" was part of the program.) On the way there he'd seen signs advertising the antiques in a town called Brundidge, so on the way back home he decided to stop and check it out. This amazing silhouette was waiting for me when I got home! 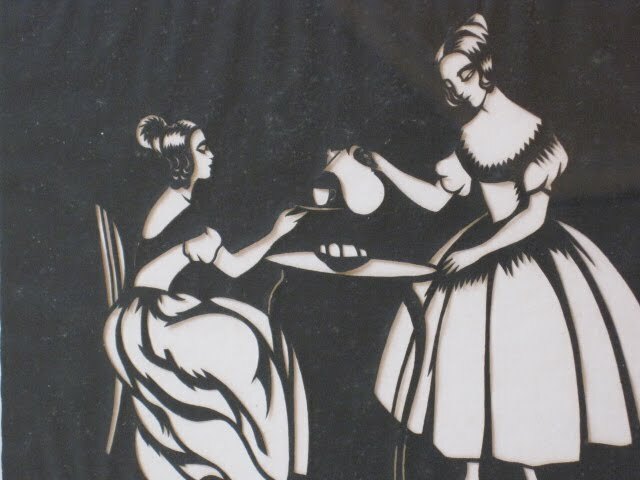 I have a few other tea-themed silhouettes but certainly nothing as fine as this. 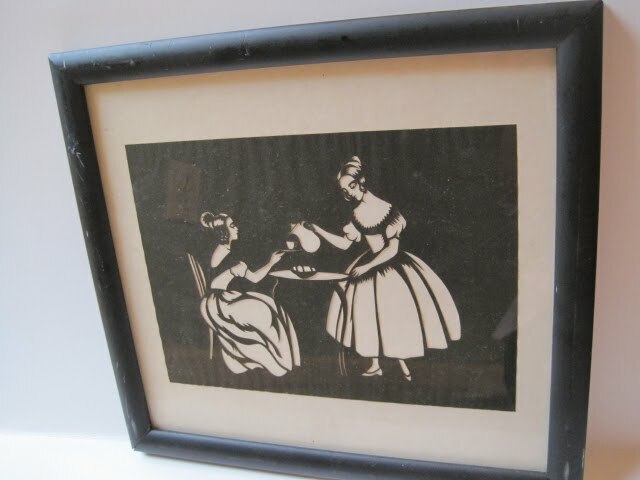 It's a little dusty and I've got to figure out precisely how to clean it, but I love-love-love this piece! 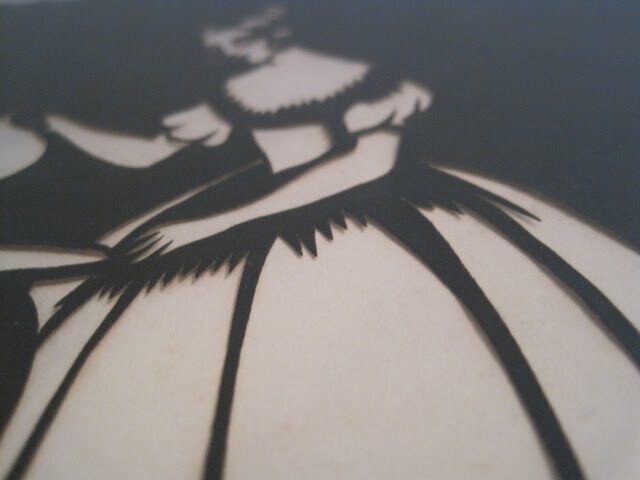 This photo is one I took at an angle so you can see the papercutting details used to make this silhouette. 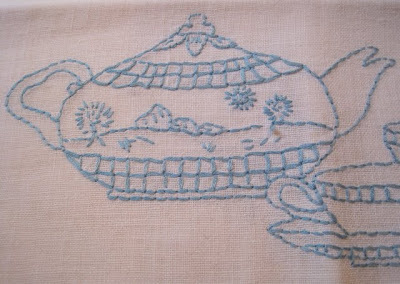 This is an art/craft form I've never learned, mainly because it doesn't appear to be very forgiving like, say, needlework. I could just see myself investing hours in a papercutting project only to slip up and slice the whole thing with my scissors. 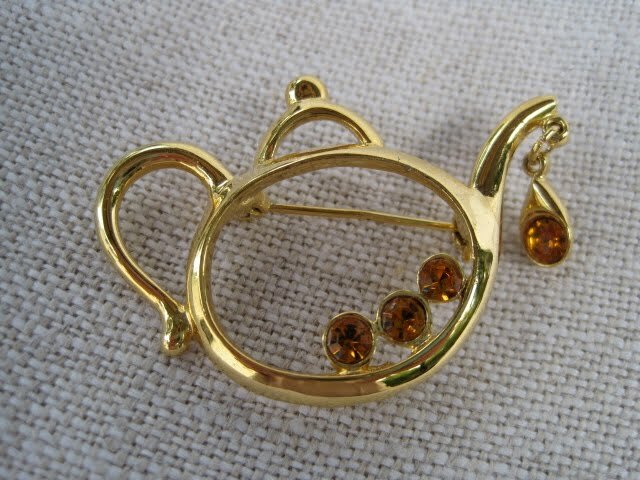 So, I'm extra happy my husband decided to visit a shop called Millicent's and find this fun piece! Since I like to buy Hallmark Christmas ornaments for all the kids in my family to open around Thanksgiving each year, I've learned to shop early. You can't assume all the designs will still be there by the third week in November, so to get your preferred ornaments you have to plan ahead. At a mall in Anniston, Ala. over the weekend, I noticed the Hallmark display was up and immediately headed inside, where I was delighted to see this new "Alice in Wonderland" teapot ornament! 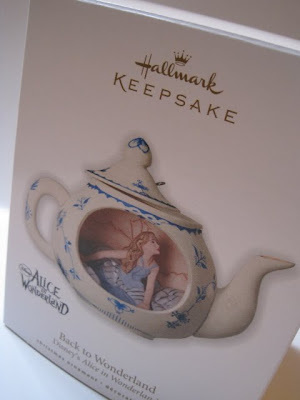 This will be the perfect ornament for my niece Cari, who absolutely loves the new "Alice" movie. Cari, her sister Madison and I saw the movie together earlier this year. My favorite scene was when Alice was inside the teapot, so I am tickled that this scene is commemorated with the new Hallmark ornament. And here's the back of the ornament. (Confession: I bought one for myself as well!) Speaking of ornaments, I've been prowling Hobby Lobby, Michaels and my other usual haunts, but so far I've not come across any teapot or teacup ornaments at all. Have you? Will you please send an alert if you do? Thanks in advance! Tea and Books Saturday #39 - "Princess Tea Parties"
Every tea library needs to have a few books for young tea lovers, and one I like is "Princess Tea Parties: Royal Gatherings for Little Ladies," written and illustrated by Michal Sparks. 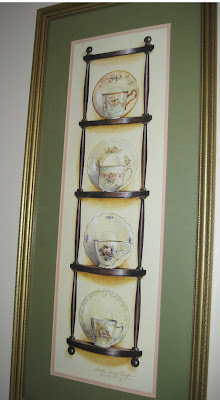 In addition to the charming watercolors, Sparks gives a nice beginner's lesson on the basics of teatime, including a bit about the history of tea, how it is made, and what equipment is needed to prepare a pot of tea. 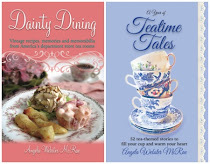 The book covers princess tea parties for all kinds of princesses, which greatly appeals to me. When I was a little girl, I heard that you were supposed to make a wish whenever you crossed a bridge. So, at each bridge crossing, I would dream that I would become a fairy princess, and alas I'm still waiting! But it's fun to dream, and little girls using this book can aspire to be royal princesses, fairy tale princesses, flower princesses and more. 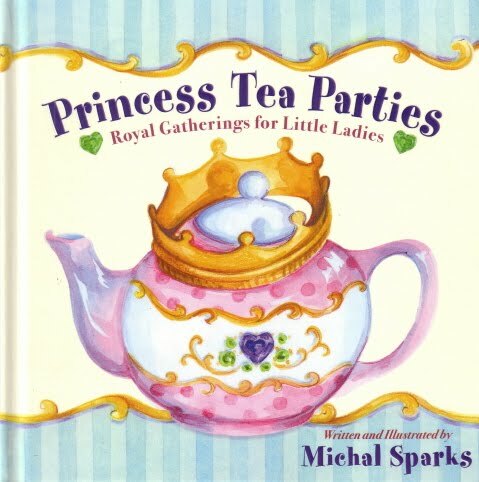 For each princess tea party suggested, there are easy recipes (the book tells girls when to seek an adult's help) and ideas for games, crafts and decorations as well. One reason I think it's nice to consult a "children's" book sometimes is that it reminds us how easy a little creativity can be. For instance, in the chapter on hosting a Princess Plum Blossom Tea, which is inspired by Japanese tea ceremonies, there is a pattern for making kimono-shaped invitations. It's super easy, so why can't big girls use that idea as well? (My "big girl" friends, however, would probably *not* like the suggestion of having guests sit on cushions on the floor!) And another reason I like to have these books available is because occasionally I'm asked for children's tea party ideas and I can loan these to friends, which I am of course quite happy to do! 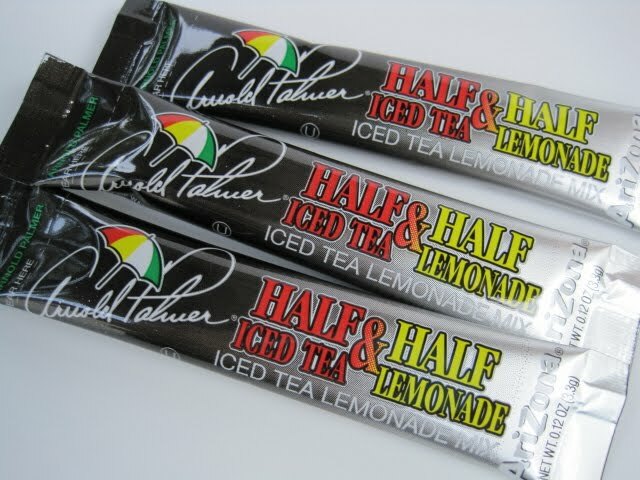 Even though it's officially fall, there a few "iced tea" days still ahead here where I live, so I was happy to stumble upon another new tea drink, this box of Arnold Palmer Iced Tea Lemonade Stix. 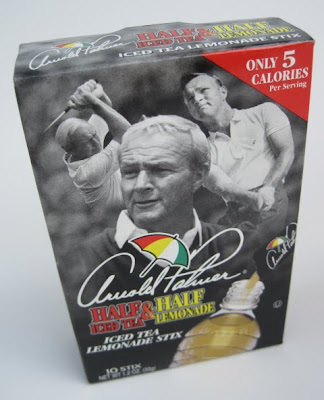 These are those portable little packets of tea that have become so popular in recent years, and I'm intrigued that "Arnold Palmers," those half-tea-and-half-lemonade drinks, have become so popular they are now the basis of a powdered drink mix. 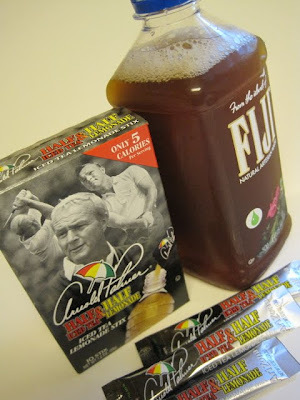 So, I poured a packet in my empty water bottle, filled it up with filtered water, and wondered if it would indeed taste as good as the ready-to-drink Arnold Palmer lemonade tea I recently tried. Yes, it does! So now I'm carrying a few packets of this mix in my purse, and it's nice knowing an "Arnold Palmer" is never more than a water bottle away! Wow, I could have had a V8 ... with green tea! I just happened to be reading Cooking Light magazine the other night when I learned about the new V8 V-Fusion + Tea drink. Turns out this is already on the shelf at my local Publix, and I bought the Pineapple Mango Green Tea flavor, although it also comes in Raspberry Green Tea and Pomegranate Green Tea flavors. The company calls it "a breakthrough juice that gives you a full serving of vegetables plus a full serving of fruit in every 8-ounce glass." So how does it taste? Delicious! Although this is indeed a drink with vegetables (including sweet potatoes, tomatoes and carrots), it definitely tastes just like other fruit juice blends I've tried, and this has only 50 calories per 8-ounce serving. I find it interesting that V8's labeling notes this drink contains "less than 2 percent" of green tea ("green tea extract," actually), yet "Tea" is certainly one of the most prominent words on the label. Somehow, I expected it to contain more tea. The bottle I bought cost $3.99 for 46 ounces, and I will probably stick to drinking my green tea unless this drink is on sale sometime. As I was googling for information, I happened to come upon the news that V8 V-Fusion + Tea is giving away samples to the first 1,000 folks who sign up on their Facebook page each week. I missed out for this week, but hopefully I'll remember to check back at noon on Monday. (Maybe some of you want to try for a sample too?) Any of you tried this drink yet? If so, what did you think of it? UPDATE: After I wrote this post but before it could publish, I saw that my friend Maureen has also discovered this drink! See what she has to say here. 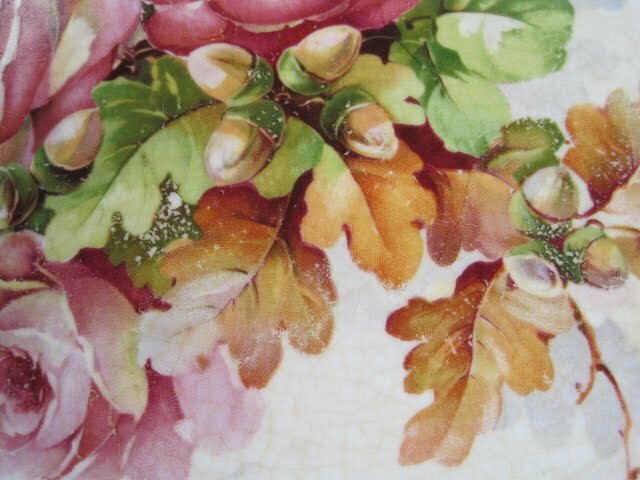 Here's an acorn-bedecked detail from a serving platter I love. And here's a clay teapot planter in a perfect fall hue. Even my tea jewelry is turning fall-toned! 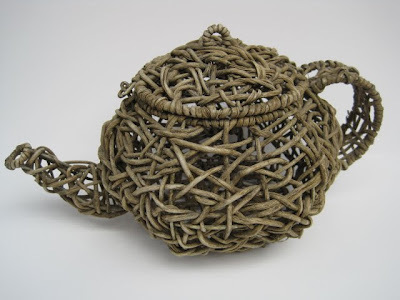 And this basket type teapot may be getting a pot of mums soon. Hmmm. 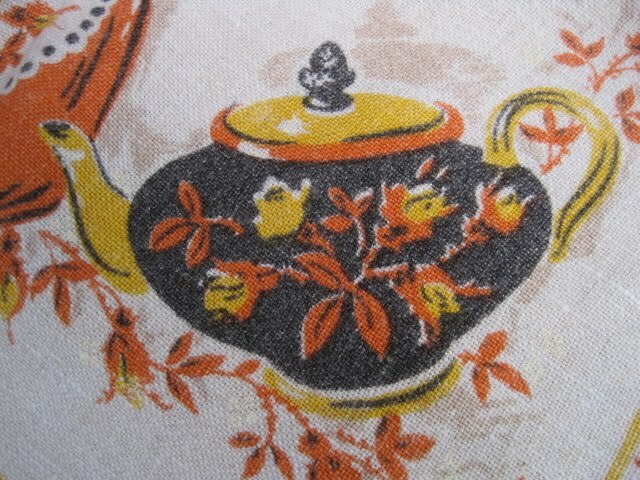 This little "Tea Bags" teapot with a teacup lid is not in my beloved pink shades, but I like it just the same. Finally, we have to have appropriate cups and saucers for the different seasons of the year, so I like to pull out my Johnson Brothers Harvest Time pattern and greet fall with a cup of tea. Happy Fall, Y'all! How successful have you been with your New Year's Resolutions for 2010? I took stock of my own recently and realized the one that most concerned me was a resolution to work on my creative writing more this year. 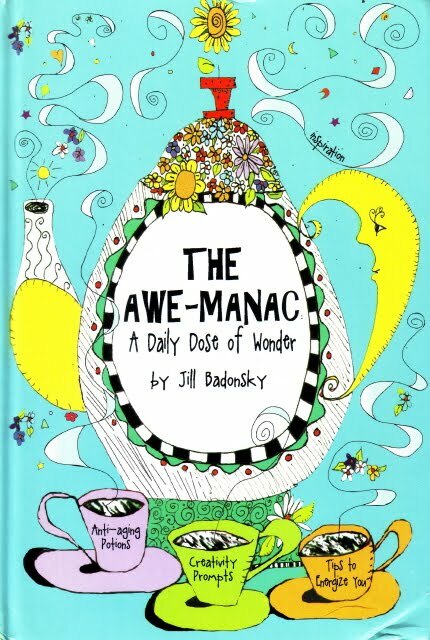 I wasn't feeling very inspired by the creative writing books I had on hand, and when I went exploring I came across this whimsical book, "The Awe-manac: A Daily Dose of Wonder" by Jill Badonsky. You can't judge a book by its cover? 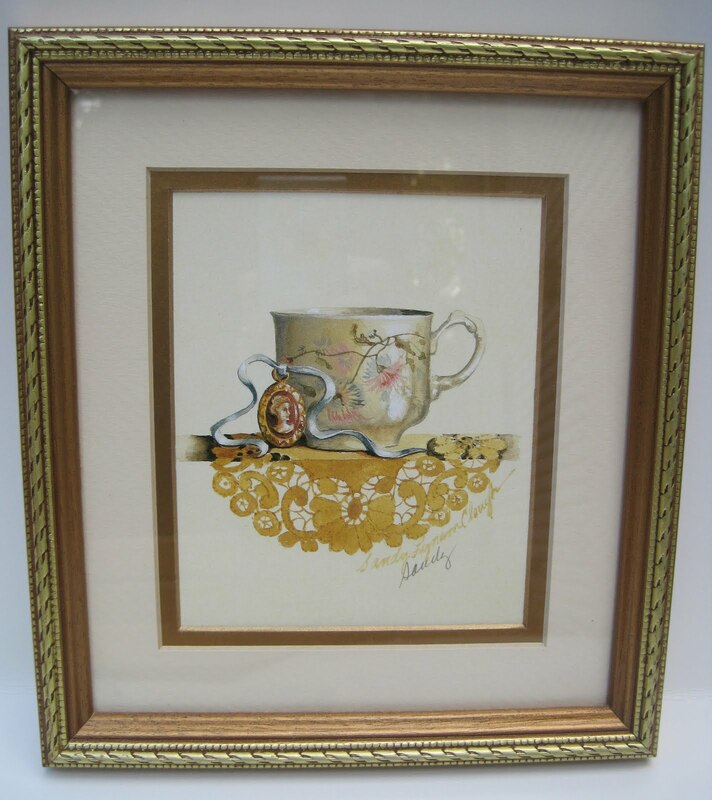 Ohhhhh, but sometimes you can, and these whimsical tea drawings inspire me every time I look at them! So yes, this book has a tea-themed cover, but I also wanted to tell you about this book because it's just such a fun read for all sorts of creative souls. And frankly, I believe *everyone* is creative in one way or another. I like to think I'm creative with writing and needlecrafting. Other friends are creative with their artwork, their photography, or their decorating. Or maybe the way they entertain. This book is rather a humorous take on the "Old Farmer's Almanac," and for each day, and at the beginning of each month, it gives you offbeat celebrations to enjoy. I particularly liked learning that September is "Be Kind to Writers and Editors Month." Amen! Other holidays include No Talk Day, Anonymous Giving Week and National Napping Day (I can't wait!). Prompts in the book are just plain fun, and I find myself eager to pull out my pen and creative writing notebook each day. Today, for instance, I used a prompt to write about "peculiar people" I know, and I know plenty. Another day's prompt led me to write about towels. Another day I was inspired to write about nitpicking. So if you need a little creativity boost, and not just about writing, this book is a great place to turn. 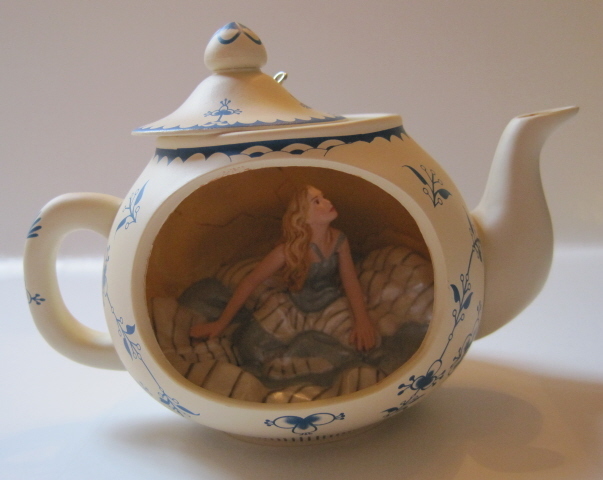 And the whimsical teaware drawings will sweeten your reading as well! It's my husband's fault. If he hadn't given me an eBay gift card for our anniversary earlier this month, I wouldn't have felt compelled to look for a "nice" eBay item to purchase, and I wouldn't have finally given in to a longtime desire to collect pieces of Tea Room pattern depression glass. Oh well, the fun begins! I suppose it was inevitable, really. As soon as I knew this pattern existed, I was intrigued. When I opened the quick-to-arrive gift, my enabler immediately said he liked the Art Deco styling. 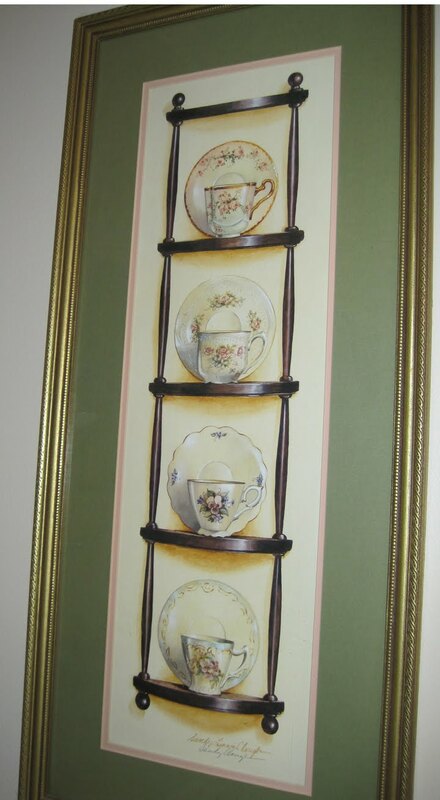 He's exactly right on the period, of course, for the Tea Room pattern was made by Indiana Glass from 1926 to 1931. There is so much I need to learn about this glassware. So far, what I've learned is this: Pieces were made in pink, green, clear and amber, and it appears the clear and amber are rarer (and not as pretty, in my opinion). 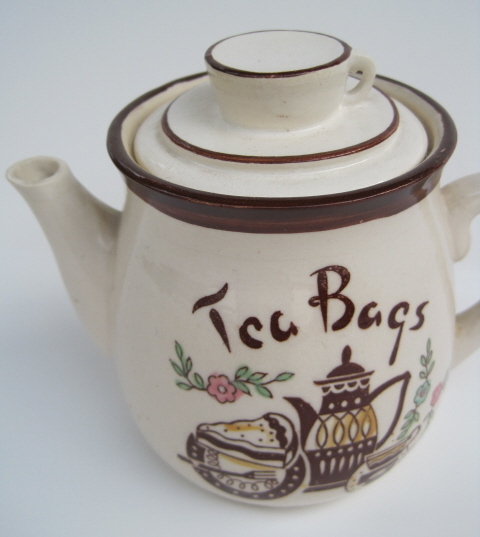 These pieces were made to be used in soda shops and tea rooms. 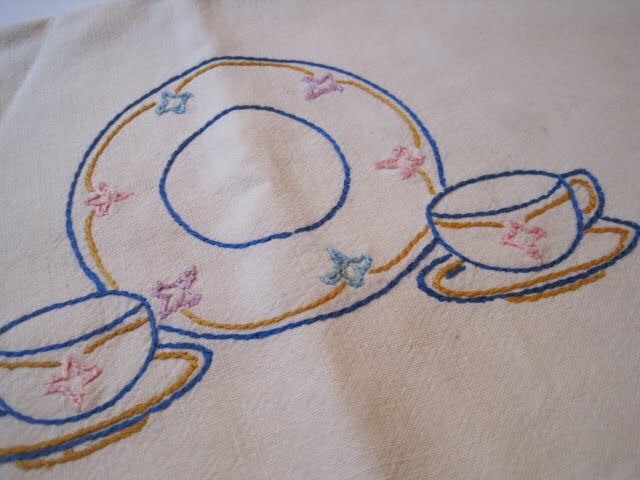 On one web site I read that production included pieces for a full dinner service, but another site said no, there were no dinner plates made in this pattern. 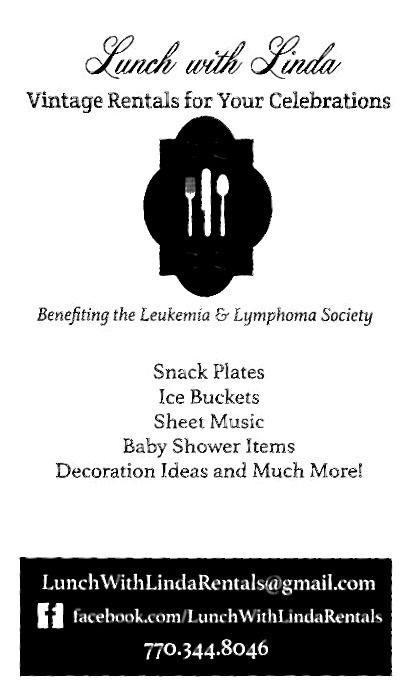 (And would soda shops and tea rooms have had a need for dinner plates?) Time -- and research -- will tell which of these theories is true. Because of the Art Deco styling, all those little lines leading to pointed edges, it is said to be hard to find Tea Room pieces in good condition (mine were! ), and I can certainly see why. With so many corners and edges facing out, it's easy to see how the damage occurred. In looking at pieces on eBay, I also learned that Tea Room pattern pieces can be six-sided or eight-sided, like this eight-sided sugar bowl shown from overhead. Researching my new pattern is fun, but I am also enjoying imagining my new sugar and creamer enjoying life in the '20s or '30s, picturing the tea room proprietress who served customers with these, or the lunching ladies whose conversations passed right over these very pieces of glass. 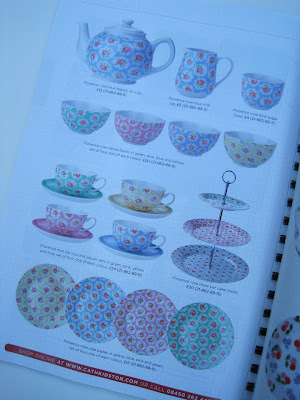 (Please tell me I'm not the only one who ponders The Secret Life of Teawares!) 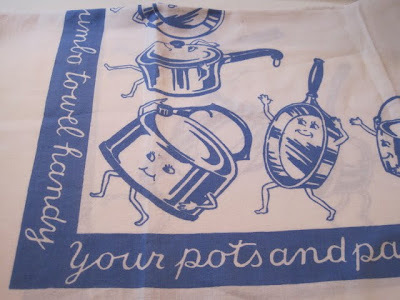 And if any of you happen to collect this pattern, I'd sure love to know more! Tea and Books Saturday #38 - "The Pleasures of Tea"
Although I've had Victoria magazine's "The Pleasures of Tea: Recipes and Rituals" for some time now, I'm not sure I've ever actually read it cover to cover, and it is just delightful! One of the first things I learned is that "purists" have a certain way of toasting English muffins. You're not supposed to toast them by slicing them first but rather by cutting a sliver in the side and then toasting them whole. Once they're done, you poke butter in through the slit. I have always split my English muffins and then toasted them, but I like this poke-in-the-butter method and will give that a try next time! 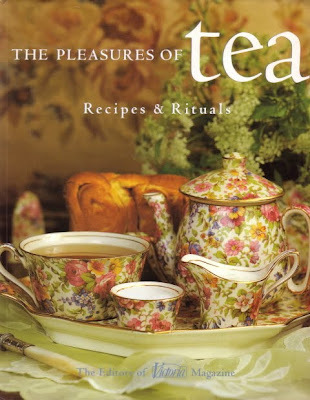 Scattered throughout the book are assorted tea-related tidbits on a variety of topics. 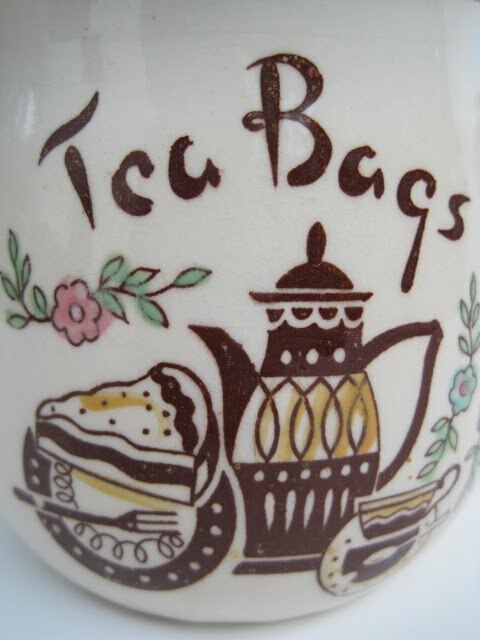 One I'd not seen before was a suggestion to use teabags to create "antique" documents by crinkling up a piece of paper, smoothing it back out, then running a hot teabag over the page. Those of you who make homemade soaps might like to know the book recommends adding powdered green tea leaves to your soaps to add a fresh fragrance. It is, however, the "spirit" of this book I love most. 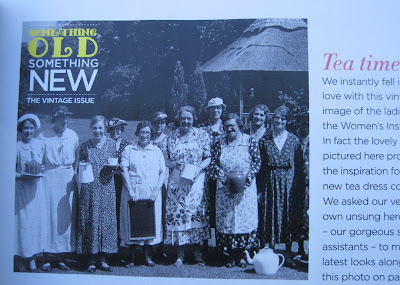 Just as the old Victoria magazine had such a thoughtful, elegant way of describing everyday things, so does this book. 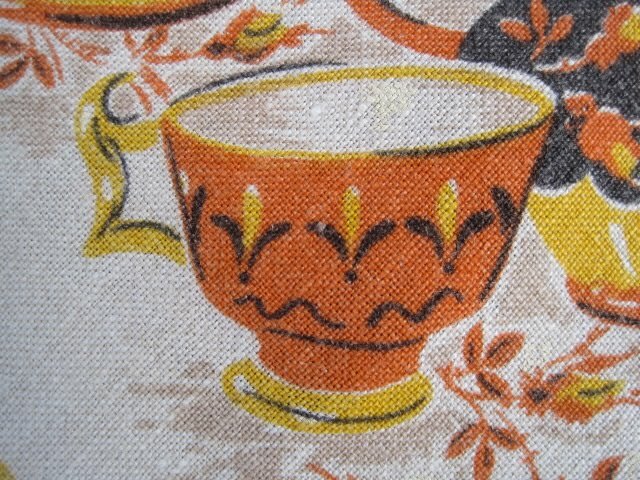 Like this: "What turns a drink of tea into an occasion? 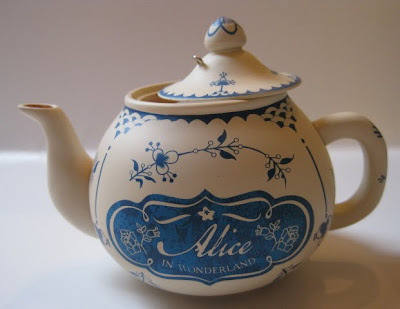 Often, the cup it is served in — no doubt one reason why so many tea lovers are just as devoted to lovely china as they are to their orange pekoe or lapsang souchong. 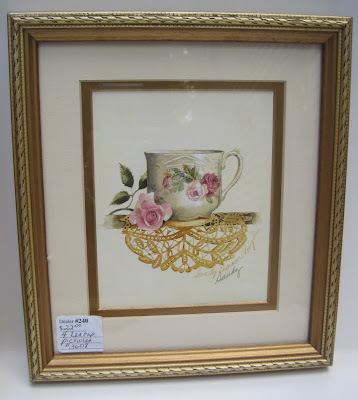 Collecting can start with the jog of a childhood memory — perhaps a swirl of rosebuds recalls some long-ago cup in which an adored grandmother offered you a bit of sweet, milky tea scented with cinnamon. 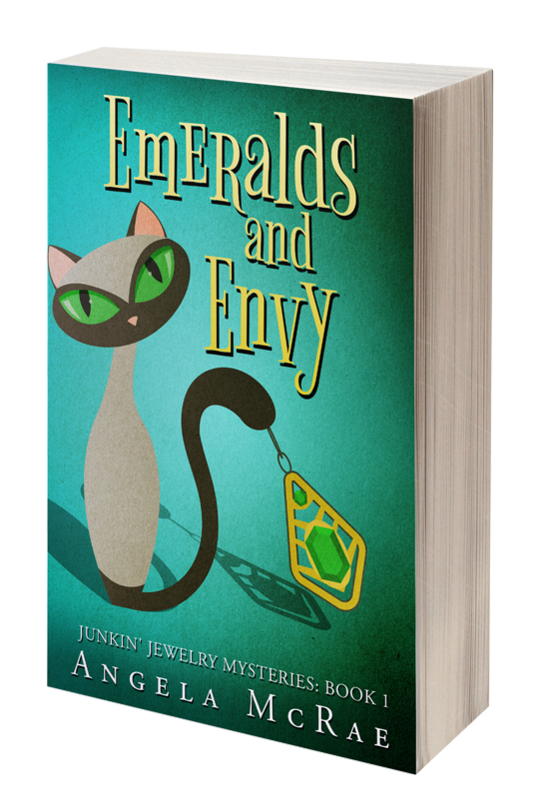 Soon you're haunting flea markets or scanning the shelves of antique shops …"
There are so many lovely passages in this book I could go on and on, but I won't! 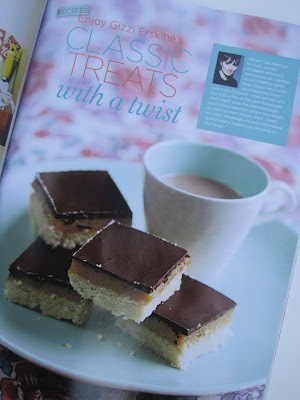 Instead I should just mention that the book contains a few dozen recipes as well, for teatime treats such as Rose Petal Jam, Honey Tea Sandwiches, Smoked Salmon Canapés and Iced Lemon Balm Tea. If you're at all sentimental about your teatimes, you will simply adore this book! It's too bad my lunchtime friends from yesterday's post got stuck in traffic on I-285 and were running a little late, but nothing could have made me happier than to have some extra time for browsing at Collectors Corner! I have rarely left there empty-handed, and this visit was most fruitful. 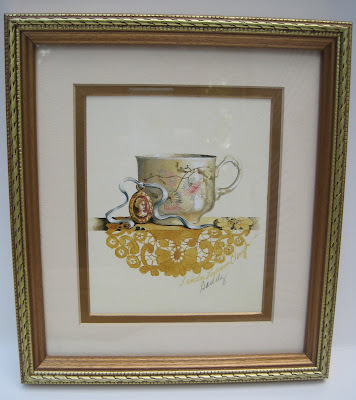 I solved the problem of what to put on a certain blank wall that's been staring at me for nearly four years: a set of Sandy Lynam Clough teacup prints! I have been holding out for "just the right thing," and when I saw this set of four *signed* and framed prints for just $22, it was a happy moment indeed! 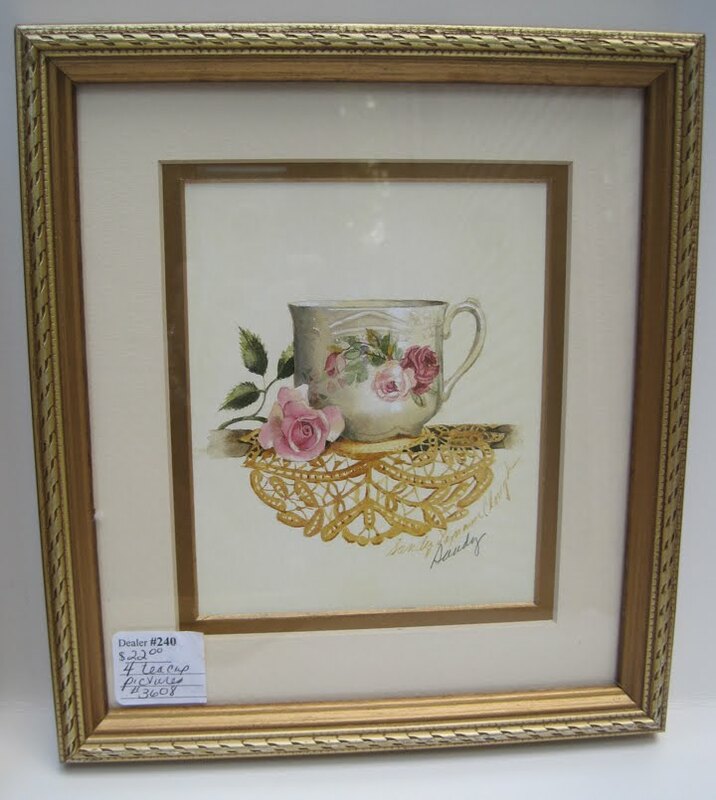 This one with roses on it is probably my favorite. 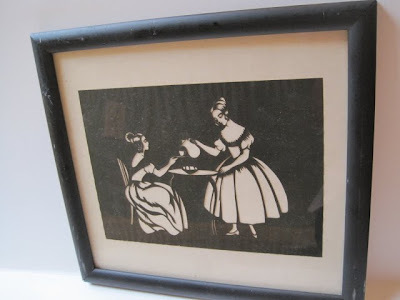 I was volunteering at a conference of Presbyterian women meeting in Atlanta many years ago and first bought one of her prints and got her to sign it. I have loved her and her work ever since! Sandy gets so many details in her work, and she gets them exactly right. 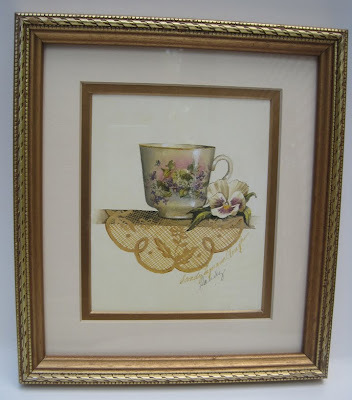 I love the shape of this teacup, the beribboned cameo and the elegant doily. 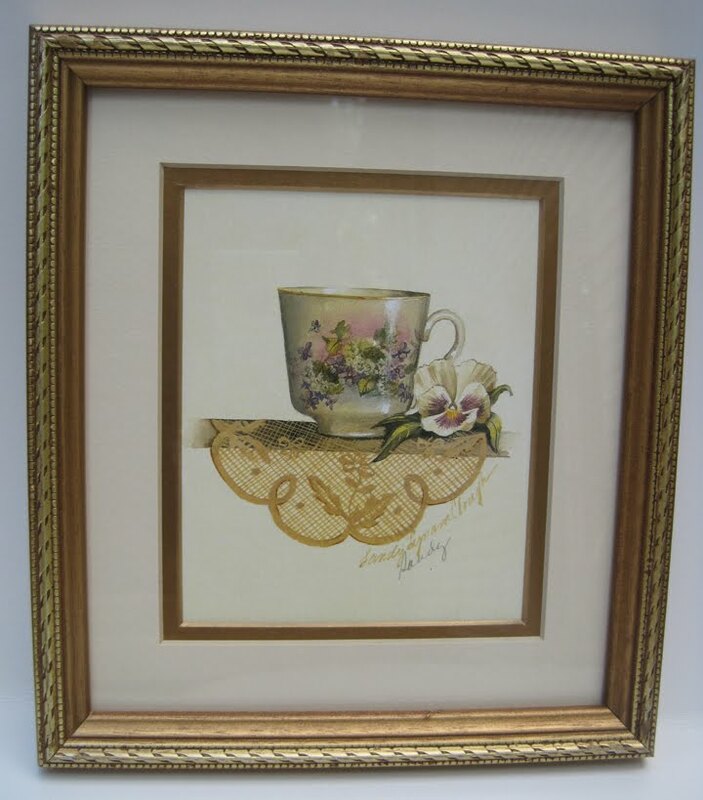 In this piece, I am drawn to the shading on the teacup and how it leads your eye to the pansy. 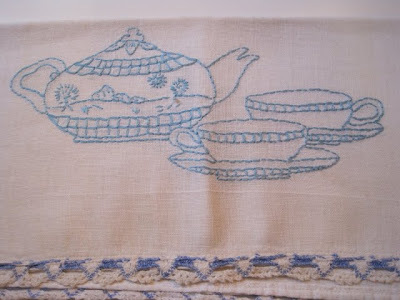 I also love the lacy appearance of the linens in her work. Finally, I have to add that my mom once found this signed SLC print at a yard sale for $1 and gave it to me for Christmas! Great minds think alike! Phyllis in Michigan, I wish you had been here on Tuesday to see what you have inspired! 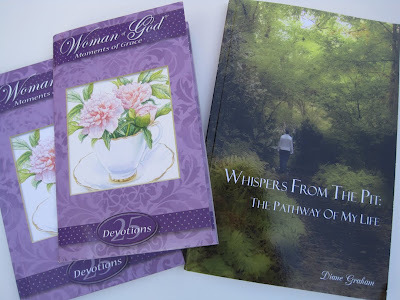 You see, earlier this year, fellow tea lover Phyllis was kind enough to send me a wonderful new tea-themed devotional book by Diane Graham and Julie Norris, "Woman of God - Moments of Grace," which I wrote about here. 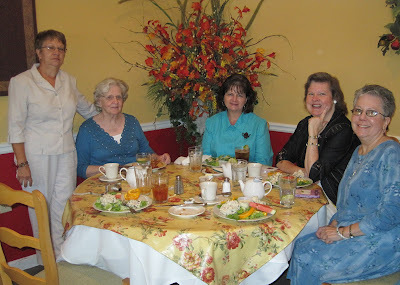 Not long afterward I heard from one of the authors, Diane, and since she and Julie would be coming from Missouri to Atlanta, near my town, in September we agreed to get together. And here we are -- Julie's in front and that's yours truly and Diane at back! I am absolutely delighted when I meet with authors who are kind enough to let me pick their brains about their writing -- the product, the process, the whole shebang. I *love* talking to writers! 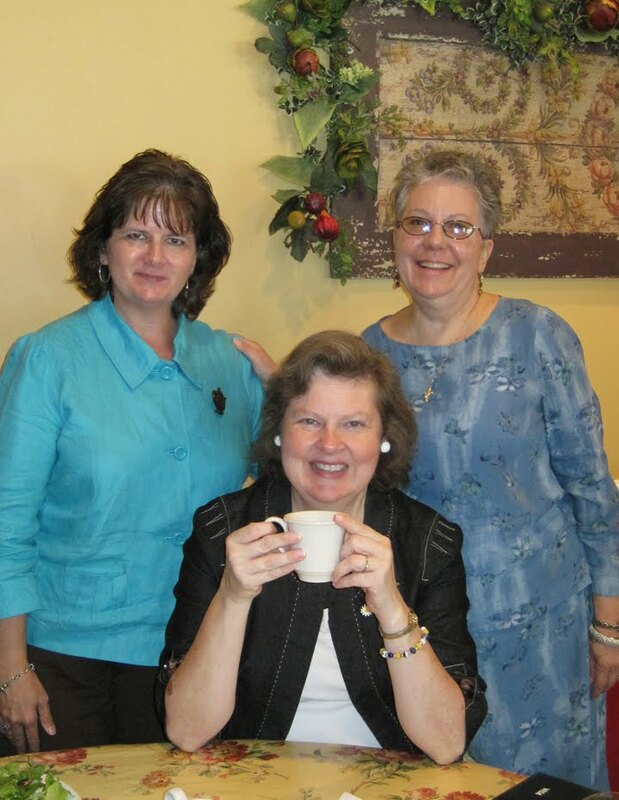 Diane and Julie were sooooo gracious and let me ask every nosy question I had, and they were even kind enough to autograph my tea devotional book that was the gift from Phyllis in Michigan, as well as another copy of their book which I'll be giving away at a local fundraiser this Christmas. I was simply fascinated to learn that Diane has also written a book about her journey through clinical depression called "Whispers from the Pit: The Pathway of My Life." I have known more than a few dear friends who've experienced challenges with depression (they are some of my funnest, funniest friends, interestingly enough! ), so I am particularly eager to read about her healing and how she now ministers to others with what she's learned. Diane and Julie are just brimming with ideas for future book projects, and I can guarantee you I'll be on the list to order a copy of everything these tea-loving gals write! All this shared over a cup of tea? It was truly a delightful afternoon! And if you'd like to get in touch with the ladies about their books or perhaps a speaking engagement, e-mail janddtime4tea@yahoo.com. Frivolitea! Congratulations, and I'll get your tea and mug in the mail straightaway! Enjoy! Loving that Cath Kidston Magazine! 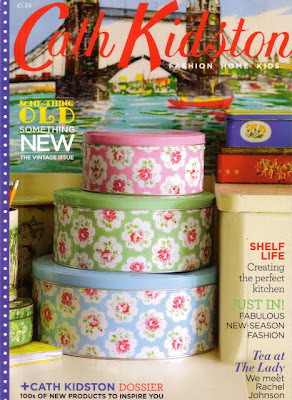 Sadly, there is no longer a Cath Kidston outlet here in the U.S., yet we fans of Cath Kidston's cheery prints can usually find the books and stationery products. When the magazine debuted last year, I was astonished to find I could get a copy for free (each issue must be ordered individually, but hey, free is free). The latest issue (August 2010) happens to be the "Vintage Issue," and I absolutely loved this vintage photo of some Women's Institute ladies with all their old-style teawares. 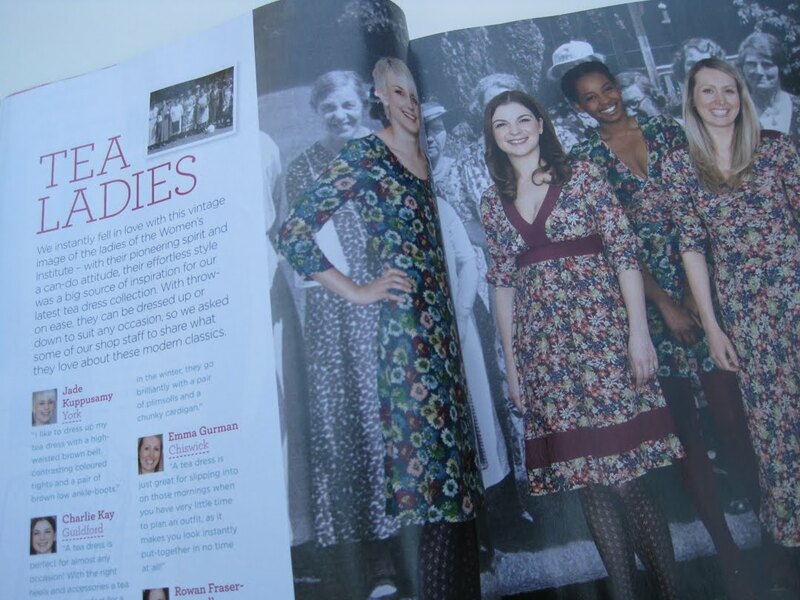 Here you see some "Tea Ladies" in their new Cath Kidston tea dresses, a scene inspired by the vintage photo. I've never heard of Gizzi Erskine, but I was delighted she is sharing several pages of teatime treats like this Millionaire's Shortbread with Rosemary-infused Salted Caramel. Yum! 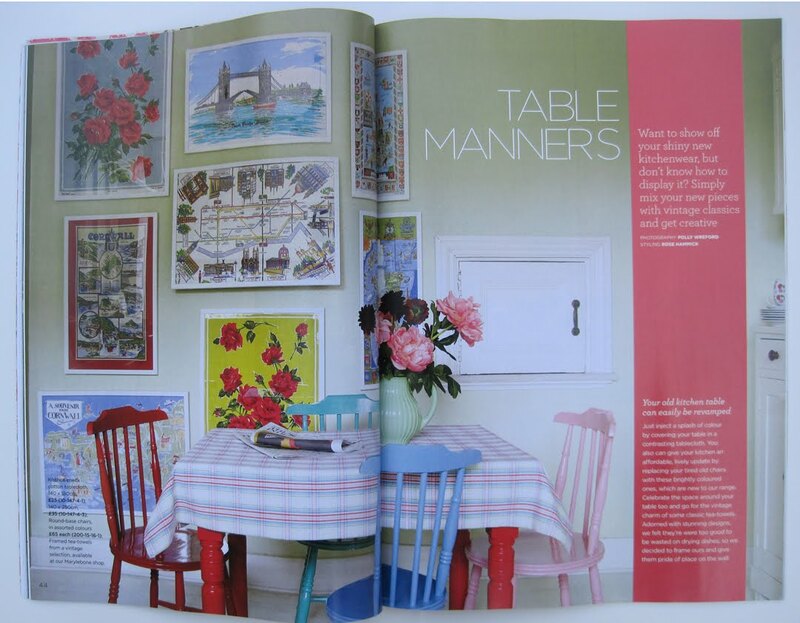 I've long thought attractive tea towels qualify as art, so I was tickled pink to see them framed and hung in this kitchen vignette pictured in the magazine! More new teas ... and a giveaway!